The Classroom Technology Services (CTS) team at the University of Nevada Las Vegas Office of Information Technology had two primary motives for getting a better handle on tech usage on campus: 1) Combination VHS-DVD players weren't exactly cutting edge, yet some faculty continued to rely on them; and 2) Some instructors tended to forget that electricity costs money, leaving equipment switched on when they walk out of the classroom. In the first case, noted Audio Video Specialist Frank Alaimo, "We were having trouble sourcing and finding these units, and we needed some concrete evidence to go back to our higher ups and say, 'Look, this technology has died; it has long since been disabled. We need to get this out of our classrooms and move forward.'" As for the second case, said Alaimo, "Sometimes instructors forget to turn off the equipment after their Friday class and we'll find it running on a Monday. That projector would have been running the entire weekend. Eventually, the equipment in their rooms fails prematurely." UNLV found the solution to both these scenarios (and others) by combining technology from the university's audiovisual enterprise management provider, Crestron, with a bit of custom programming by Michael Theil, CTS' classroom control systems specialist. Now the team can track AV equipment usage within the 367 classroom and departmental spaces it supports — helping reduce costs and downtime. Eventually, the same setup could help the institution monitor other smart systems on campus to reduce energy usage. The spaces overseen by CTS include 162 general-purpose classrooms and a similar number of departmental spaces — "computer labs, study halls, study rooms, anything that has AV," explained Manager Scott Menter. Currently, the typical equipment inventory in a classroom consists of a lectern, a projector, a motorized screen with a Crestron control system, a PC inside the lectern, a document camera and auxiliary inputs for HDMI and VGA. Then there's a Blu-ray player and that loathed VCR/DVD combo. Up until a few years ago, when an instructor would walk into a classroom, there was no way of knowing what kind of AV gear might be on hand in any given space. There was no uniformity regarding brand or age of components. When Menter arrived, he and his team began the process of standardizing the equipment and building up integrated classroom control with the adoption of Crestron DigitalMedia. This product handles the processing, transmitting and distribution of digital video — either presentations or videoconferencing — across classrooms and other rooms using a single cable running on its own virtual LAN. The advantages of this work were many. For one, an integrator could set up a new classroom in under a day, a job that previously might take two integrators two days to perform. For another, the faculty member could use a common touchscreen interface created by Theil to operate the technology. "If a teacher leaves one building and goes to another building, it's all the same. It's like looking at an ATM machine," said Alaimo. Plus, whatever is in that room can be controlled from a central console. Previously, Alaimo explained, somebody would have to follow the manual route: haul a laptop to a given room to do firmware updates or physically travel across campus to address an AV problem in a classroom. Now those kinds of activities can usually be handled with the touch of a button. In June 2015, CTS bolstered its AV management with Crestron Fusion, a cloud service that provides "total control of the classroom," said Menter. For example, a common problem occurs when an instructor selects the PC on the AV interface while the PC isn't turned on. From the CTS offices, "We can actually look and see there's no source detected, so we can tell them to turn on the power button. That usually fixes it the vast majority of the time." Or, he added, the system can be used to monitor lamps in projectors for usage time. "When they get up to 90 percent, we get a notification. We'll change it before it burns out." Much of the magic has been introduced by Theil, who programmed modules in Fusion that serve dual purposes. On the one hand, he can deploy custom features for instructors, such as the prof who likes to play audio clips to accompany his instruction when he's using the document camera — not normally a source for sound. That feature can be picked on the console by any other educator who wants to use it; or it can work in any classroom that particular faculty member is teaching in. Theil is able to push updated code and any interface layout changes to each of the rooms. Or he can configure modules to detect what's going on in the classroom. That's how he figured out just how much usage those VCR/DVD combo players were getting — by measuring what AV input is selected, how long it's been selected and how many times. As Menter explained, "We were actually able to take the time, the date, how long, and who pushed the button on the VCR." By tracking it back through the university's CollegeNET 25Live scheduling application, CTS could identify which instructors were still using the VCRs. Most of that activity was concentrated in a single building. "Once we cross-referenced what instructors and departments were using those rooms, we found out that history does a lot with VHS," said Menter. As a result, his group — with the help of the library — will be reaching out to members of the history department to help them understand how to "transition their materials." "If they cannot find the title in a digital format, they have streaming services, and the library will work with them in trying to find a title that's comparable to what they've been using in class," he said. Many asset monitoring systems can send alerts when it's time to replace a bulb in a projector. But Theil used the data he was generating with Fusion to understand the impact of various practices, such as leaving equipment turned on when nobody's using it. The work began by looking at the use of automatic shutoffs. "Instructors forget to turn off the equipment," Theil observed. "They want to leave it on for the next instructor, maybe. But the problem with that is they think that the lamps in the equipment are inexpensive and that you can go down to Home Depot and pick one up for $5." (The lamps actually cost almost $500.) If somebody is teaching the last class on a Friday afternoon and abandons it, Theil pointed out, the projector could stay on for 60 hours or more. Source not detected: After 15 minutes of nothing being projected or plugged in, the devices shut off. Projector mute: The projector is blanked, a setting used by the instructor to enter passwords or momentarily darken the screen to use the whiteboard behind it. Frequently, what happens in that scenario is that the instructor forgets the projector is still turned on and walks out of the classroom. That state times out after an hour and turns off the projector. Touch panel inactivity:If nobody touches the panel in three hours — two class cycles — the assumption is that the room is empty and that devices are to be turned off. Over the course of three months, Theil collected data in 54 rooms and then extrapolated that across an additional 121 rooms over two semesters to determine just how many hours would be saved through the use of the auto-shutoff. The total: 165,088 hours. Then he examined the financial aspects of having to replace projectors and lamps prematurely. Over two semesters, the use of the auto-shutoff could save $27,514 in $500 projector lamps and $66,035 in $4,000 projectors, as well as about $251 in student worker labor costs to handle the work of replacing the bulbs. In addition, the amount of power saved by turning equipment off when not in use totaled about 82,544 kilowatt hours, equivalent to a $4,124 reduction in utility bills. The savings added up to nearly $97,929 for a spring and fall semester. As Theil pointed out, "What we're really showing is that we're saving $100,000 that we don't have to spend on replacing the equipment. As we get more data, we will get more accurate estimates and may find we are saving even more." Theil added that the ability to view all that data in one place is another time saver for his department. "Not only does Fusion give us all the information now, we can quickly see what's happening in the room," he said. "It allows us to amalgamate all the information that's coming from different places. So I don't have to log into the projector UI to see what it says, and then go into the audio processor to get its information. Fusion takes all that information from different places and puts it into one display that we can see for all the rooms across campus in real time. It saves us a lot of time and gives us control." 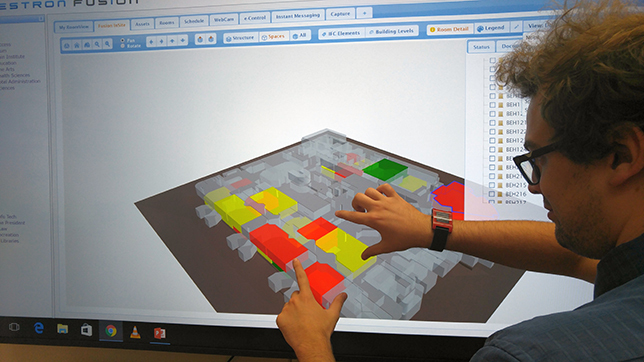 Now that CTS has measured the impact of using data generated through Fusion for AV, it plans to reach out to university facilities folks to propose trying it to monitor the building and classroom energy draws of lighting and HVAC settings. The team will also be sharing the results of Theil's ROI study with the organization on campus that invested in the standardization of AV: planning and construction. "They gave us quite a lot of money to implement this in there," said Alaimo. "I'd like to show them how much we're saving them." CTS is also getting ready to exploit an additional function of Fusion: the ability to look at all of the university classrooms in three dimensions on a 65-inch touchscreen monitor. "Just by touching on each one you'll be able to see the attributes for that room — a shortcut to all of the controls of that room," said Menter. What UNLV is doing, emphasized Alaimo, won't be the same for everyone: "Some schools might not care about how much electricity they use. They might not care about lamps because they use laser projectors." On the other hand, he added, "They might want to see how many times their class is used on the weekend or how many times it was used at night. They might want to use their Fusion polling for different reasons. It's just that what Fusion can do for us it can do for others."